150 in stock Need More ? Illustrations and text on inside cover. 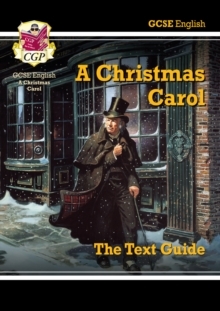 This CGP Text Guide contains everything you need to write top-grade essays about 'A Christmas Carol' by Charles Dickens. It's suitable for all GCSE English exams, including the new ones starting in summer 2017. Inside, you'll find clear, thorough notes on the novel's context, plot, characters, themes and the writer's techniques - with quick questions, in-depth questions and exam-style questions included at the end of every section. There's also detailed exam advice to help you improve your grades, plus a cartoon-strip summary to remind you of all the important plot points!